Deep thought provoking questions on self-awareness draws attention to one of the most amazing aspects of being alive - that is, getting to know ourselves. Through self-awareness we are in touch with the body. Through awareness we are in touch with our deepest values and core beliefs. Awareness inspires us. Yes, awareness inspires us. It infuses us with the very quick of life. Once this awareness is turned towards the self - we become self-aware. Stepping out-of-the-mind is a process of becoming more aware, more awake to life. The mind has its way, but awareness isn't part of it. We are all born with awareness. We can be aware of our environment, aware of our thoughts, our emotions, and feelings. Yet, our daily life shows us that self awareness cannot be taken for granted. It can easily be lost. Caught in compulsive or reactive thinking, for example, we lose touch with awareness. We become blind to anything that is happening outside of the mind. Have you ever sat in a movie to suddenly realize that you've been blind to what's been happening on screen? That's being blind, while being trapped in the mind. What does it mean to be, or to become, self aware? Is feeling self conscious the same as being self aware? What is the central difference between self consciousness and self awareness? 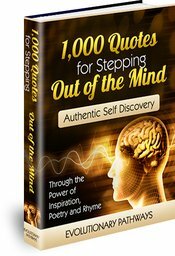 Is the capacity for self awareness a uniquely human quality? Are other creatures capable of self awareness in the same way that we are? What is the hidden potential in our capacity for self awareness? What does the capacity for self awareness mean for our ability to know ourselves, grow and change? Would conscious change be possible without the capacity for self awareness? How would we know where we are and where we are heading without self awareness? Is self awareness the same as self knowledge? If they are different, then what is the relationship or connection between the two? What prevents us from being fully self aware? Is there anything that gets in the way of our capacity for self awareness? What is the relationship between self-awareness and awareness itself? How can we cultivate self awareness? How can we make it an everyday practice? What is the relationship between self awareness and thinking? Does our ability to think enhance our ability to be self aware? In what ways may it actually hinder it? Rene Descartes is famous for saying "I think, therefore I am." How true is this assertion? Is it beyond question? Is it possible to 'be' even in the absence of thought? How about self awareness - is it possible to be self aware without thought? Socrates' most famous and insistent admonishion was to, "Know thyself." What is more important for knowing ourselves - our capacity for self-awareness or our capacity for analytic thought? How important is self awareness for personal development and self improvement? How important is a keen sense of self-awareness for creating positive change? What is the role of self awareness in breaking a habit and in creating a new habit in it's place? What is especially important to be aware of when working on changing habits? What is the relationship between self awareness and change? Between self awareness and evolution? Is self-awareness a passive state to be in? Can we become more self aware in hindsight, or is self awareness only possible in the present moment? Is 'self-awareness' that happens in hindsight more appropriately described as self-knowledge rather than self awareness?